When I worked at Nordstrom, I held an annual Vendor Accountability Summit. Given that this was in the pre-Google days, the primary attendees were the co-ops, list organizations, printers, paper reps, and database vendors (until we moved our database in-house in 2002). I received permission to share the profit and loss statement with our vendors. I know, I know, you'll never do that. But imagine if you did do it?! Your vendor partners deserve to know if your business is dying, or if it is thriving. How else can your vendor partners possibly give you optimal support if they have no idea what you need? At the Vendor Accountability Summit, I would share the profit and loss statement. In the case above, I'm going to show my vendors just how miserable business is. Next, I'm going to dig into the findings of my Diagnostics project. I'll gladly illustrate that my company is having a hard time selling new items. If you have a website optimization vendor, don't you think that vendor wants to know that your new item productivity is in collapse? Don't you think they want to help you make new items as productive as possible? These people care, they want to assist you. They cannot assist you when you're not honest with them. Show your vendors that the twelve-month buyer file is dying. Show your vendors that to keep the business afloat, you're trying to prop up the business by raising prices. Show your vendors that customer order frequency is in decline. Show your vendors that you are promoting the living daylights out of your customer file, trying to keep the file afloat. Tell your vendor partners that there is no more room for promotional strategy. Show your vendor partners that your business started to die in September 2013, and continued to struggle through October 2014. Show your vendor that you simply cannot acquire new customers - you have a real, fundamentally business problem here. Yes, it is time to open the books. Share the plight of your business with your vendor partners. They deserve to have information necessary to grow your business. In upcoming posts, I'll get back to linking this information to the Partner Dashboard. Here's what happens in basketball when the coach calls the plays and the player ignores what the coach wants to do (click here). "We told our co-op that performance is awful. We told them that performance has to improve. They told us to trust the models. It's as if they don't even care what happens to us." In sports, you do what you're told, or you are benched, and then suspended. Players play, coaches coach. In business, you are the coach. End of story. The vendor doesn't get to call the plays. You hear me go off about co-ops in catalog marketing, and omnichannel vendor theory in retail. There's a good reason for that. In both cases, the vendors are calling the plays. You can't let that happen. Vendors will call plays that optimize their performance. You hire vendors to optimize your performance!! Vendors do not call the plays. It is time to take control over your vendor relationships. Enough is enough. The most important component of Vendor Leadership Management (VLM) is the Partner Dashboard. Click on the image for details. Now, your list of vendors is going to be significantly different than this list, a typical list for a catalog brand. So please follow along, and sub in your vendors where applicable. 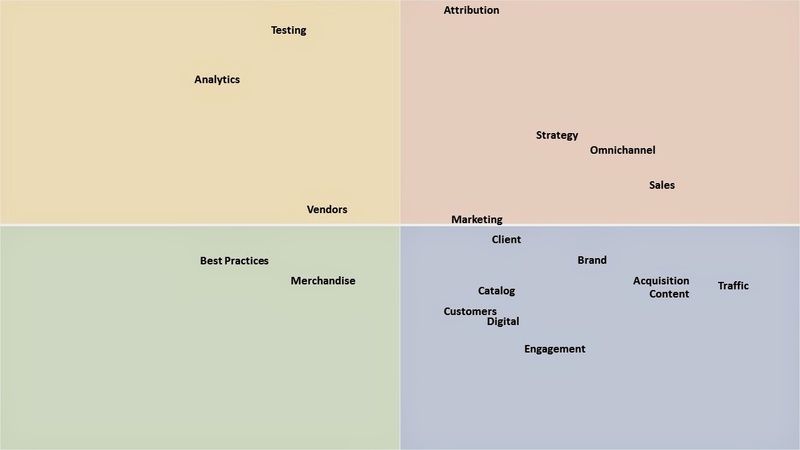 In this example, I evaluate my vendors on the basis of five objectives. 20% = Increasing Company Profitability. 20% = Increasing New + Reactivated Buyers. 20% = Increasing The Number of New Winning Items. 30% = Outstanding Customer Service. Within each category, each vendor is graded from 0 (horrific performance) to 100 (exemplary performance). I know, I know, I can hear folks screaming already ... "We host your database, how the heck can we ever contribute positively to the number of new, winning items?" Tough. There are all sorts of ways you can contribute. Create custom variables in the database that segment customers who purchase new items on a regular basis - how about that? Every vendor can contribute. Every. Vendor. The criteria come from the objectives the Marketing Vice President is evaluated against for the upcoming year - by doing this, we align vendor incentives with the objectives that determine if the Marketing VP gets to keep her job or not. Fair enough? After scores are tabulated, a weighted average score (called "Net Score") is calculated. The table is then ranked, from highest "Net Score" to lowest "Net Score". You don't want to be on the bottom of this list, do you? But if you are on the bottom of the list, you know exactly why you are on the bottom of the list. Co-Op #3 is at or below average at everything. I wouldn't want to be this co-op, with three co-ops outperforming it. The Affiliate Vendor is horrific at customer service. That one should be easy to fix, right? Co-Op #2 gets high marks for innovation, and those high marks keep Co-Op #2 out of the worst spot on the list ... probably keeping names flowing through Co-Op #2 and not Co-Op #3 as a result. The paper rep gets low marks for customer service and profitability ... that's what will happen when you lock your client into long-term deals that are only beneficial to the paper rep. I would share this dashboard, on a monthly basis, with every vendor. Create an email distribution list, and share the list - share it with your Executive Team, share it with the employees in your department, and share it with every vendor. Yes, Co-Op #1 should know that Co-Op #3 is performing poorly, and Co-Op #3 should know they are worse than all other Co-Ops. Everything should be transparent. If you're at the bottom of the list, you know exactly why you're at the bottom of the list. In upcoming days, I will talk about annual objectives, and I will talk about how to determine the 0-100 scores for each vendor. So your vendors are not listening to you? Your co-op tells you to trust the models. Your pay-per-click vendor tells you that it's going to cost more and more and more on Google until Google is the only profitable company on the planet. Your boutique agency is forcing a product upon you that you don't need. Your research brand wants you to engage in consulting because their core business model is failing and they told Wall Street this is their future growth area - not that you need their consulting in the first place? What are you going to do about it? Yell at 'em? That doesn't work. I would hold a Vendor Accountability Summit. Invite every single vendor who supports your marketing department ... yes, every single one. Demand that a Vice President and your rep be in attendance from every vendor, where applicable. Invite your Paid Search / PPC Vendor. Invite your Email Service Provider. Invite your Website Optimization Vendor. Invite your Website Analytics Vendor. Invite any other Vendor / Consultant / Research Sales Person etc. If your vendor won't attend, well, that tells you something about that vendor, doesn't it? The framework I will describe is directionally similar to what I used at Nordstrom, though I am going to expand on the concept given the explosion in vendor-to-employee ratios in modern marketing. We need more detail today than used back in 2001 to achieve greater accountability. This is a day-long event. Here's the agenda. 9:00am - 9:15am = Introductions. 9:15am - 10:00am = Overview of Business Performance, and Goals For The Coming Year (you perform this presentation ... sharing everything ... the good ... the bad ... the ugly ... profit ... loss ... your feelings of desperation). 10:00am - 10:15am = Break. 10:15am - 10:30am = Meet With Your CEO. Your CEO will explain why marketing partners need to significantly improve performance. I always did this early in the day. 10:30am - 11:00am = The Partner Dashboard. Here, on a dashboard, you show a rank-ordering of grading of each of your partners, evaluating their annual performance from best to worst. If your affiliate is performing best, and provides the best customer service, put them at the top of the list. If your paper rep hiked prices and is simply ignoring you unless JCP decides to mail a catalog and then sends you an email telling you that JCP is the future, rank them at the bottom. Share the rank-ordering on the list with every person in the room, regardless whether feelings will be hurt or not. Feelings will be hurt. You are simply holding folks accountable. Make it clear how the rankings are created. More on this in later, and in upcoming posts. 11:00am - 11:15am = Meet With Your Merchandising Leadership Team. This team will explain the merchandising strategy for the upcoming year, and hopefully, the folks in the room can interpret the process and help you sell better as a result. 11:15am - 12:00pm = Open Question and Answer. Folks in the room get to ask questions, given the information shared in the morning session. 12:00pm - 1:15pm = Lunch. Feed these folks well ... something better than wrapped sandwiches, moist pickles, and chocolate chip cookies. But that doesn't sound too bad, either, so go with that, why not? 1:15pm - 3:30pm = Partner Presentations. Each partner/vendor is given 15 minutes to publicly share how they are going to improve performance in the upcoming year. Your partners may need assistance from other partners to obtain improved performance, your partners may need you to spend more to increase sales, it doesn't matter ... this is their opportunity to make a difference, and to impress the competition. All folks, employees and partners can ask questions. 3:30pm - 3:45pm = Break. 3:45pm - 4:45pm = Follow-Up Plan. Host this meeting once per year. However, you will provide reporting to the entire team on a monthly basis, illustrating to the entire team how well everybody is performing. Clearly communicate that, based on your evaluation formula, you will rank-order the entire team monthly, from best to worst. Make it clear that they don't want to be at the bottom of the list (the relegation zone, to use an English Premier League soccer comparison). Hammer home the criteria you will evaluate folks on. 4:45pm - 5:00pm = Tell everybody that you do like them, you do respect them, but you'll be out of business soon without better support. If you feel like the day went well, praise everybody, and send them home. If you feel like the day went poorly and your partners didn't care, let everybody know that you will be talking to NEMOA leadership about illustrating the results of your year-long evaluation at the 2016 Spring Event as part of a keynote presentation. Given that we're in late February, I'd hold your first-annual summit in April, so that your vendor partners have plenty of time to impact fourth-quarter results. Notice that I mentioned something called the "Partner Dashboard". The "Partner Dashboard" is critical. 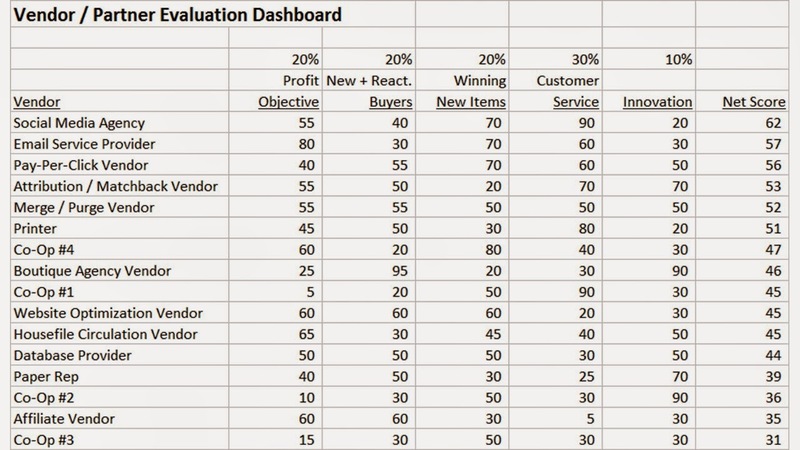 This is a dashboard that evaluates each vendor based on the criteria that is most important to you. Vendors are rank-ordered, from best to worst, for all to see, based on performance. This is the dashboard that you use to hold folks accountable. Your vendors will know if they are exceeding, meeting, or missing your objectives, in comparison to their competition. Yes - if you work with two boutique agencies, each will get to see how each other is evaluated. Yes - you need to do this. There's nothing that inspires competition more than a dashboard that rank-orders vendors from best to worst, based on the criteria important to you. I have found that it is best to be very firm in this first meeting. Honest, open, and firm. 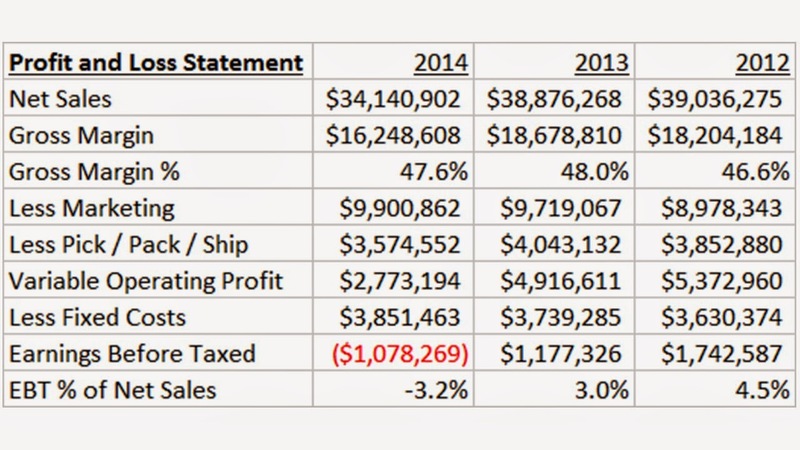 Share the five year profit and loss statement for your company. Your vendors are under non-disclosure, so this should not be a problem. If your CFO objects, invite your CFO to the meeting and have her present the information sans tables/charts. Share every single customer metric you have. 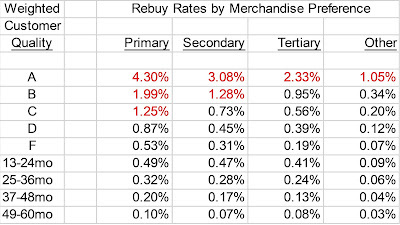 Annual Repurchase Rates ... Orders per Buyer per Year ... Items per Order ... Price per Item Purchased ... Average Order Value ... Annual Demand per Buyer ... 12 Month Buyer Counts ... Annual First-Time Buyers ... Annual Reactivated Buyers ... Website Traffic ... Conversion Rates by Segment ... Twitter Followers. Share your marketing budget - broken down by advertising channel ... ad-to-sales ratios, cost per new customer - then compare it with lifetime value. Share your five year customer file forecast ... you have one of these ... right ... right? Show your vendor partners why you need new customers. Share the lifetime value of your customer. Share inter-channel metrics ... all these omnichannel customers that are not increasing your profit by a single penny. Your vendor partners are going to be a lot more helpful when you treat them like an actual employee, and grant them access to actual customer data. Then, be firm. You need results, or your job is at risk. In so many ways, your vendors determine if you get to keep your job or not. You cannot lose your job because co-op performance is at -22% and they simply tell you to have faith in the models. This is a new way of working with your vendors ... who, quite honestly, are your employees. Rest assured, some of your vendor partners are going to freak out ... freak ... out. They will hate this. They will hate the accountability, they will hate being compared to others, they will make excuses, they will refuse to attend, they will stonewall you in the months after this day-long summit, they will lie, they will badmouth you publicly, telling others that you are a "bad client". This means that you that you should not be working with this vendor. Other vendors will give you lip service, then, they'll go home and nothing will change. Unless productivity is well above average, this means that you should not be working with this vendor. In the catalog world, I'm exhausted by all the complaining about the co-ops - complaining that is not associated with action on behalf of the co-ops. Your business is dying ... and nobody seems to care. It is time to hold folks accountable. It is your job to hold folks accountable. Let's get started. Tomorrow, I will share a mini-dashboard, as an example of what you need to be doing to start to hold your vendor partners accountable. When you are employed at a company, you are usually subjected to an Annual Performance Review (APR). We've all been reviewed, many of us have reviewed hundreds or more individuals. The process isn't much fun, for either party. It's not fun to tell somebody that they are not performing well. 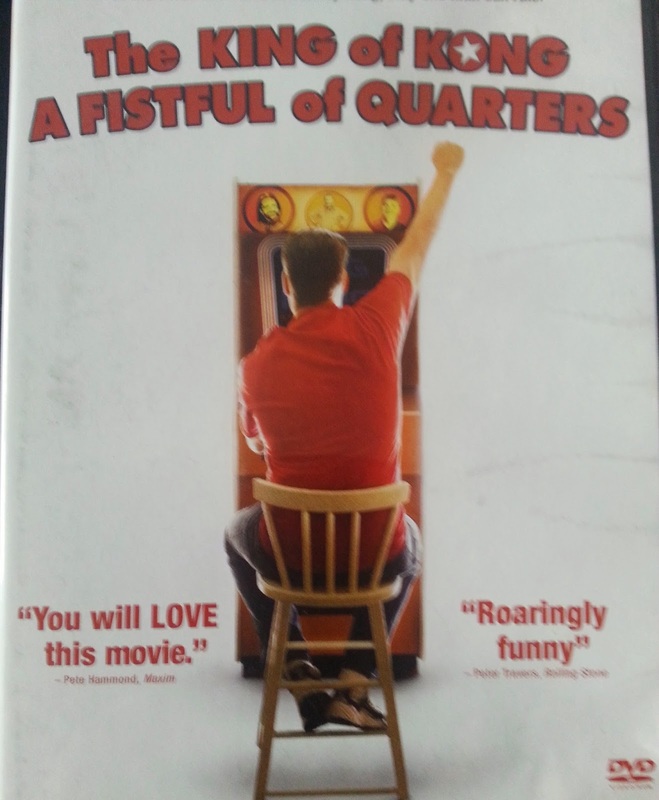 We've all been on the receiving end of a bad review, justified or not. But the process serves a purpose. We accept the feedback, and we improve. In 1995, when you led a department of 24 people, you evaluated 24 individuals. You rank-ordered them, you knew who to promote, you knew who to not keep around. 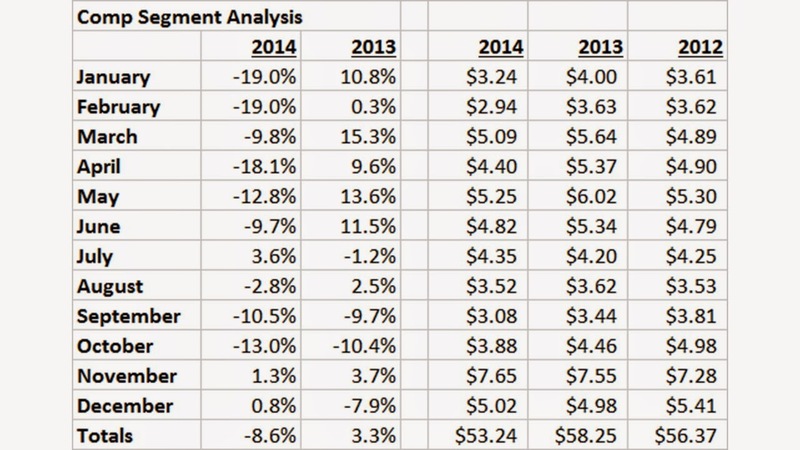 In 2015, when you lead a department of 8-10 individuals and 20 unique vendors, you have different challenges. You give annual performance reviews to your staff of 8-10 individuals. Do you give a vendor performance review to the 20 unique vendors? In the upcoming days, I am going to talk about the Vendor Performance Review (VPR). More specifically, I am going to integrate three concepts. A Diagnostics Project, which is essentially similar to getting an annual physical. The Diagnostics Project outlines what your company needs to improve upon in order to be successful. A Vendor Summit, where you invite all of your key vendors in for a day-long discussion about your business, describing how you want your vendors to support your business in the upcoming year, based on the outcome of a Diagnostics Project. A Vendor Performance Review (VPR), where, on a monthly basis, you describe to each vendor, via a scorecard, where the vendor stands among all other vendors, in terms of performance. I used this framework at Nordstrom, to great success. The approach I describe will build upon the Diagnostics Project and Partner Summit used at Nordstrom. I will explain, in much more detail, how my thinking regarding the Vendor Performance Review (VPR) has evolved since my time at Nordstrom. It is my opinion that most of the folks I work with are really, really struggling to hold vendors accountable, in a framework outside of hiring/firing vendors. Progress doesn't happen from hiring/firing, progress honestly happens when a vendor knows exactly what needs to be done to create success in your organization, and then improves performance and delivers upon your goals. If the co-ops knew that cataloger customer files were dying and rapidly aging, and the co-ops knew specifically what they had to do to be successful, we'd see better co-op performance. Those co-op folks want to please you, but without good information, they're not able to please you. So, tomorrow, we talk about the Partner Summit. Be ready! It's the story of 2015 among catalogers. "Our housefile performance is reasonable, but our co-op customer acquisition efforts are bad. Really bad. And nobody in the vendor community seems to care." This guy cares (click here). I've been asked by clients to visit the co-ops, to help the client get the productivity needed to move the catalog needle once again. 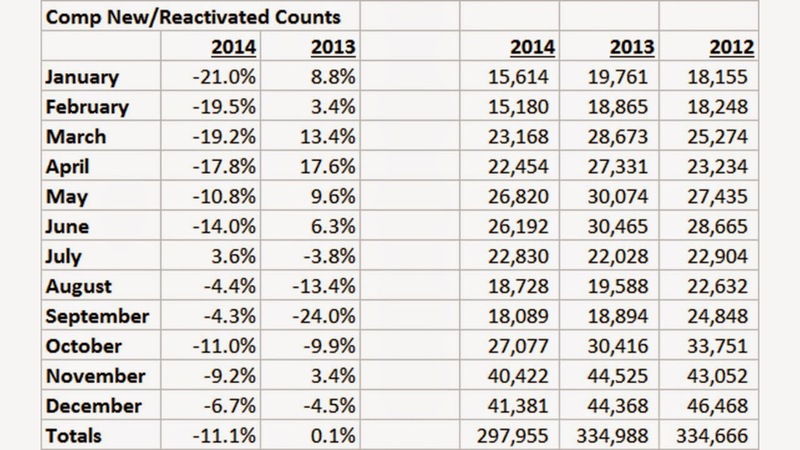 I've been told that when clients talk to the co-ops, with the notable exception of Wiland (keep that in mind), they get nowhere, even when they demonstrate that co-op productivity is down 10% to 30% vs. 2013, and 2013 was frequently down vs. 2012. Do you realize that I've been talking about the co-op feedback loop for nearly nine years? In two weeks, this blog turns nine years old. I have consistently discussed the negative ramifications of the co-op feedback loop with you ... over and over and over and over and over again. There's a direct correlation ... the more I talk about the negative impact of the co-op feedback loop, the more you shift your customer acquisition activities to the co-ops. So I am going to outline the co-op feedback loop one more time. Once more. After today, I'm done. I have about 10,000 uniques who see at least one bit of my content on a monthly basis - clearly the majority of the catalog industry has read something from me over the past nine years outlining the problem. Obviously, you are entertained by what I say, as demonstrated by record readership levels, but most of you do the opposite of what I recommend. So I, too, am now going to do the opposite. I am going to stop talking about it. If most of you consistently do the opposite of what I recommend, then maybe you will, as an industry, finally address the problem if I stop trying to address the problem. Here it is, the co-op feedback loop, for one final time. Soak it in. Bookmark this post (click here for the url), so that you can refer to it in 2025 when co-op response has been down at a compounded 20% rate for ten consecutive years and you cannot afford to use them anymore and have no way to acquire new names because your core customer is 78 years old. In 1995, co-ops were a great idea, because the average catalog shopper was around 40 years old. Catalogers struggled with the concept, and did not fully embrace it. In 2005, the co-ops were already past their prime, with an average catalog customer being +/- 50 years old, and Google / Amazon were undercutting the co-ops, fully owning customers age 35 and younger. However, catalogers were fully embracing the co-ops, and in the process, drove the catalog list industry into extinction. In 2010, with an average catalog customer being +/- 55 years old (often much older) and co-ops now fully owning the customer acquisition process for catalogers, a terrible dynamic took over. The dynamic: Co-ops sent catalogers 55+ year old customers. These older Baby Boomer shoppers loved a specific set of merchandise ... merchandise that older Baby Boomers loved, of course! As a result, your merchandising teams responded to what older Baby Boomer customers were buying, and made sure plenty of it was in the catalog. Then, you sent the names of customers who purchased this merchandise back to the co-ops. The co-ops modeled their names, found that older Baby Boomer customers were most responsive, and sent you even more older Baby Boomer names. Your merchandising team observed that older Baby Boomer names loved more merchandise desired by older Baby Boomer names, and fundamentally shifted the assortment away from what a younger customer would ever consider buying. As a result, online, younger customers had terrible conversion rates when visiting your website, because they didn't want to buy what Grandma and Grandpa liked to buy. Where online conversion did exist, it existed among catalog source coded names, and it existed on merchandise that older Baby Boomers loved to purchase. So catalogers sent these responders back to the co-ops. The co-ops, meanwhile, were being starved of younger customers by Google / Amazon, and increasingly, Facebook. The co-ops could only send older Baby Boomer customers to catalogers, because that's who catalogers sent to them. This is a tough nut to crack for co-ops, too. The co-op feedback loop was in full force, beginning in about 2010. Today, in 2015, the co-op feedback loop has damaged both catalogers and the co-ops. I am not certain that catalogers and/or co-ops can get out now. I think it is too late. The cataloger can get out by using a bridge merchandising strategy coupled with online marketing tactics. The co-op cannot ever get out. With the audience limited to older Baby Boomer customers, and with remaining catalogers aggressively targeting the co-ops (no other choice), response rates began to swoon. With response in free fall in late 2013 and through most of 2014, the feedback loop is about to chew up both the co-ops and catalogers. Both sides are about to experience unfortunate long-term productivity declines that could have been avoided had action been taken five to ten years ago. There will be short-term gains, from time to time, but the long-term trend is not looking good. 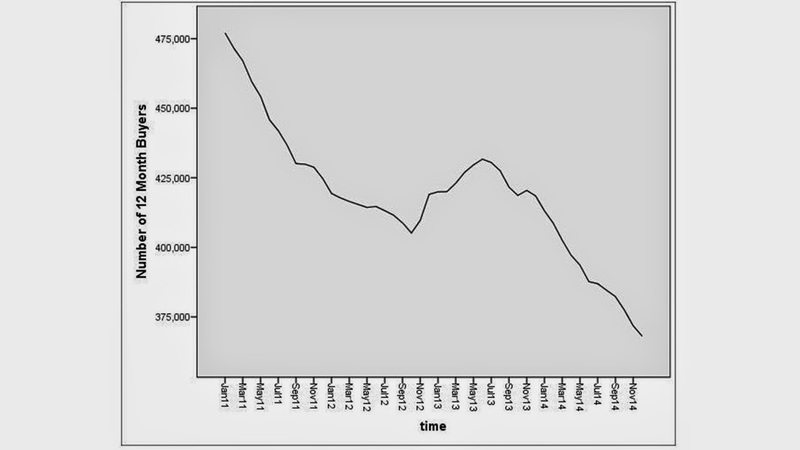 Go look at your productivity metrics from 2005 - 2014, trend the co-op numbers, and tell me what you see. Be honest. No matter how hard your co-op models names for you, the problem cannot be reversed long-term, because the names are too heavily skewed to older Baby Boomers and are now over-contacted by catalogers using the co-ops, driving down response. The only way (my opinion - your mileage will vary) to reverse engineer the problem is for catalogers to apply a bridge-merchandising strategy, identifying similar merchandise that young Baby Boomers and Gen-X appreciate, selling the merchandise via online marketing. This is a long process, a risky process, and a process that will not help the co-ops anyway, because the names are all part of a mass online ecosystem. In case you were wondering, the Amazon / Google / Facebook ecosystem is about to be obliterated as well, by a yet-to-be-determined mobile ecosystem ... their dependence upon Jennifer / older Jasmine is shutting out younger Jasmine / Jadyn. Nature has a funny way of revealing fundamental truths to marketers. That, my friends, is the co-op feedback loop. And I'm done talking about it. I know, I know, you're asking me, "Kevin, what else can you write about to entertain us, and when we finally cannot take it anymore, how will you help us get out of the co-op feedback loop?" There is a core problem that most catalogers, e-commerce marketers, and retailers need to deal with. This core problem overrides what is happening with the co-ops, it overrides the pay-to-play structure that has overwhelmed conferences that give you non-stop vendor-centric messaging. The core problem explains why when you ask your co-op to help improve catastrophic response declines you instead get no assistance and are told to be more omnichannel or to trust the models or to work with boutique agencies that "get it" or are told that it is your fault because your merchandise stinks (even though housefile names are performing just fine). The core problem is vendor accountability vs. employee accountability. See, in 1995, I worked at both Lands' End and Eddie Bauer. The direct marketing department would have averaged about 24 people, between the two companies. Almost all tactics were managed in house. In 2015, at comparable companies, you'd have maybe 8-10 employees, and the 8-10 employees would manage 20 different vendors, maybe more. In other words, your modern direct marketing team is comprised of more vendor staffing than in-house staffing. With your 8-10 employees, when performance is bad and the employee refuses to help you, you fire the employee and find somebody more talented and more cooperative. You have control. With your 20 different vendors, when performance is bad, do you have any control over the employees working for the vendor? No. You have no control. At all. If a co-op employee tells you to trust the models, well, you're stuck. There are only four big co-ops, and you're already in all four, so what exactly are you going to do? You're not going to leave the co-ops, and you're unlikely to be able to fire the folks who are not giving your account attention. In other words, you've lost control. You outsourced pay-per-click, you outsourced your database, you outsourced all customer acquisition to the co-ops, you outsourced email to an email service provider, you outsourced housefile planning and circulation strategy and merchandising analytics to a boutique agency. Every one of those decisions was probably a good one at the time, when made individually. In total, however, your decisions represent a catastrophe. These folks, your vendors, they control your future. Not you. You don't control your future. They control your future. How, exactly, do you get all 20 of the vendors on the same page, doing exactly what you want, 24/7/365? Go ahead, tell me how?! How much time do you, personally, spend with the modeler in Denver working on your co-op models, for instance? This, my dear readers, is the core problem. I'll bet you can lose your job when your company isn't profitable. Your vendor employees, well, they lose their job when their company isn't profitable. Do you see the conflict of interest there? This is the core problem. Going forward, I'm not going to single out the co-ops, or anybody else. Instead, I am going to focus on vendor accountability. Vendor accountability is the true problem you're vexed by. You don't have a credible way to nudge a vendor down the path that is most beneficial to your business. Vendors, however, have an entire ecosystem of trade journalists, pay-to-play relationships, consultants, and conferences to nudge you down the path that is most beneficial to their business model. Did you get an email from a printer or paper rep when JCP decided to mail one (1) catalog, an email "proving" that catalog marketing is back in vogue? Did you get an email from a printer or paper rep when SkyMall went bankrupt, an email lamenting that catalog marketing is dying? Vendors have an entire ecosystem designed to nudge you down the path that is most beneficial to the vendor business model. Your job depends upon bending that system into a system designed to be most beneficial to your profitability. Tomorrow, we begin the process of holding your vendors, of which there are more individuals working on your issues at vendor brands than within your entire in-house staff, fully accountable for your business performance. It won't be easy. But I've used a system in the past, a system that was highly successful at Nordstrom. I will expand upon the system, building upon it in upcoming posts this week and next week. As far as I am concerned, the whole purpose of social media is to obtain an email address. We need to get the prospect interested enough to contribute an email address. The job of email marketing is to educate the customer, to inspire the customer, to get the customer to visit our website. The job of our website is to show off the entire merchandise assortment, and to generate a profitable transaction. Once we have a profitable transaction, our job is to migrate the customer into our app. There, we show the customer new merchandise, and new merchandise fosters loyalty. Tell me what you think of the statements outlined above? Did you hear about the poor folks at 1-800 Flowers? Click here for details. I cannot imagine the nightmares associated with shipping live plants to customers, especially in sub-freezing weather. It's easy to ship a sweater. It's harder to ship something that is alive. You can be the smartest omnichannel marketer in the world ... a real channel master ... and yet, when the customer receives the image at the start of the article (click here to see the image on Facebook), well, omnichannel becomes irrelevant, doesn't it? I recently worked with a business that grew by 62% over three years ... 50% of the growth came from an increase in merchandise productivity. This business figured out exactly what the customer wanted to purchase, and in the process, grew to over a hundred million in annual sales solely by being an excellent direct merchant. When you are an excellent direct merchant, all of your marketing channels perform better, allowing you to spend more on marketing in all available channels, allowing your channels to perform better, allowing sales to increase, exposing the business to more customers, creating more word of mouth, increasing inexpensive customer acquisition, further growing the business. All of that, simply from improving merchandise productivity. Conversely, you mess up your product strategy, and no amount of omnichannel brilliance will save you. Omnichannel is a tactic, probably a necessary one. Merchandise, however, means everything. Too few marketers focus on merchandise. It's time to focus on merchandise. I want to clear up some misinformation that is circulating out there in the vendor community about my use of web visitation data in determining who should receive a catalog. By the end of this post, every vendor in our industry will be able to run the analysis themselves, will be able to make profit for their clients, and will be able to generate profit for themselves. With a Statistics degree and twenty-seven (27) years of modeling experience in a professional marketing setting, I will fully explain the methodology to all vendors and clients, so that the information can be used to generate profit for all. There is a very interesting dynamic that occurs when you analyze web visitation data. Here is a simple segmentation of monthly direct channel demand, by recency (days since last purchase, past two years), and whether the customer has visited the website in the past two years. 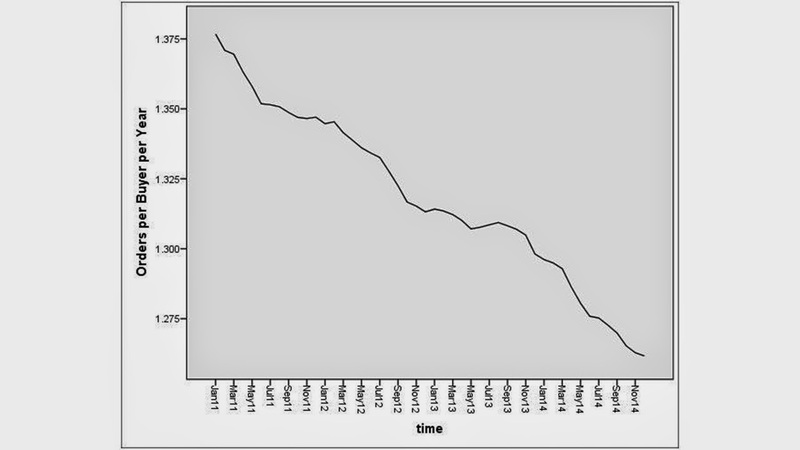 The column "mean" represents how much the customer spent in the next thirty days. What do you see? Well, if a customer ever had a website visit (1.00), the customer is worth twice as much as a customer without a historical website visit. At this point, one might conclude that you have to, absolutely have to, use web visitation data in catalog circulation models. But if you stop your analysis here, you miss out on all of the delicious goodness that comes from understanding how web visitation data truly impacts future purchases after controlling for historical recency and historical spend. 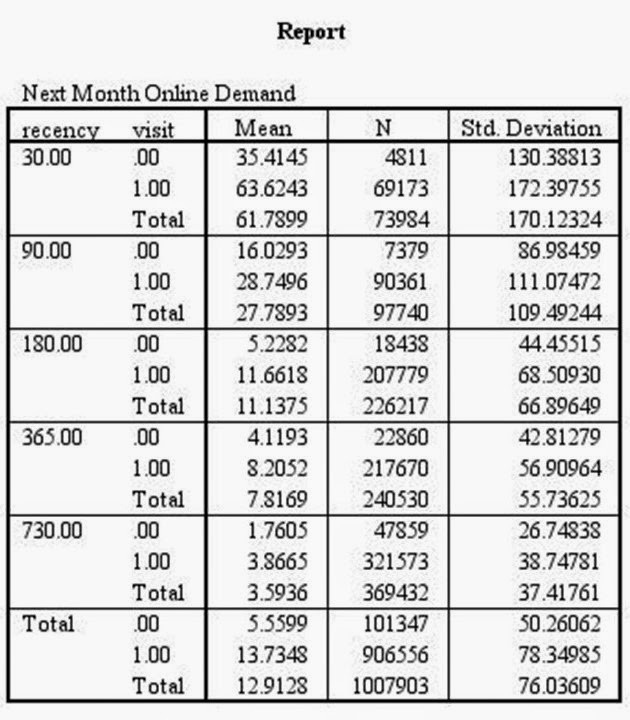 Let's run a logistic regression on next month's online demand (1 = respond, 0 = no purchase) ... we'll use demand spent (demand / 100), summed 0-30 days ago, 31-90 days ago, 91-180 days ago, 181-365 days ago, and 366-730 days ago. Then, we'll add variables for number of website visits 0-7 days ago, 8-30 days ago, 31-90 days ago, 91-180 days ago, 181-365 days ago, and 366-730 days ago. Here's the first run, a forward entry logistic regression. Look at Step 11. Look at the VISIT variables. What do you see? Visits 0-7 days ago are important (coefficient = 0.252). Visits 8-30 days ago are marginally important (coefficient = 0.080). Visits 31-90 days ago are essentially irrelevant (coefficient = 0.004). 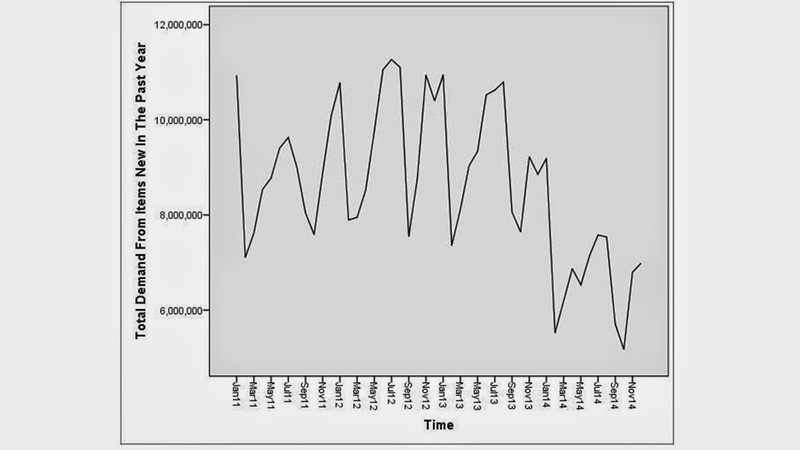 Visits 91-180 days ago have a negative coefficient (meaning they hurt future response). Visits 181-365 days ago have a negative coefficient (meaning they hurt future response). Visits 366-730 days ago have a negative coefficient (meaning they hurt future response). In other words, in the first table, where it looked like website visits doubled the future value of the customer, we were incorrectly looking at the information. 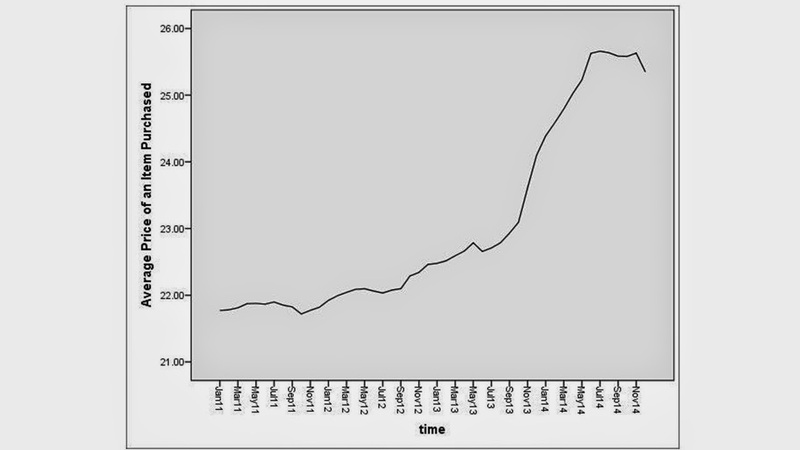 It turns out that historical website visits are highly correlated with historical demand spent. That makes common sense, right? A customer who spent a lot in the past visited the website a lot in the past, right? The variables are correlated - they essentially represent the same thing. And in a proper modeling environment, where we control for historical demand and historical recency, website visits beyond the past 30 days have no impact whatsoever. Now we can evaluate the value of web visit data. Visits 0-7 Days Ago = Coefficient of 0.235. Visits 8-30 Days Ago = Coefficient of 0.065. Visits 31+ Days Ago = Coefficient of 0.000. Value of Visits 8-30 Days Ago = 0.065 / 0.235 = 28% of the Value of Visits 0-7 Days Ago. Value of Visits 31+ Days Ago = 0.000 / 0.235 = 0% of the Value of Visits 0-7 Days Ago. 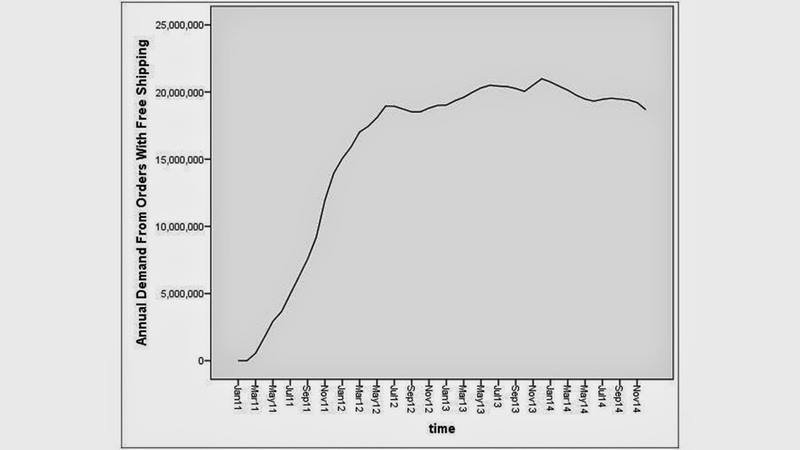 Old web visitation data offers no value whatsoever, after controlling for recency / historical demand (demand / 100). Web visitation data from 8-30 days ago has 28% of the value of web visitation data from 0-7 days ago. Web visitation data from 0-7 days ago is important, no doubt about it. Looking at the coefficient, just one web visit from 0-7 days ago is worth about $170 spent 30-90 days ago. This is why I clearly stated, a few weeks ago, that large catalogers use web visitation data in the past seven days as an indicator to kick out a hotline catalog ... they do this to capitalize on the very, very short half-life of web visitation data in a catalog environment. Ok, somebody might say that visitation data has minimal impact on response, but it probably has an impact on spend if a customer responds. Here's the ordinary least squares regression equation to measure spend. 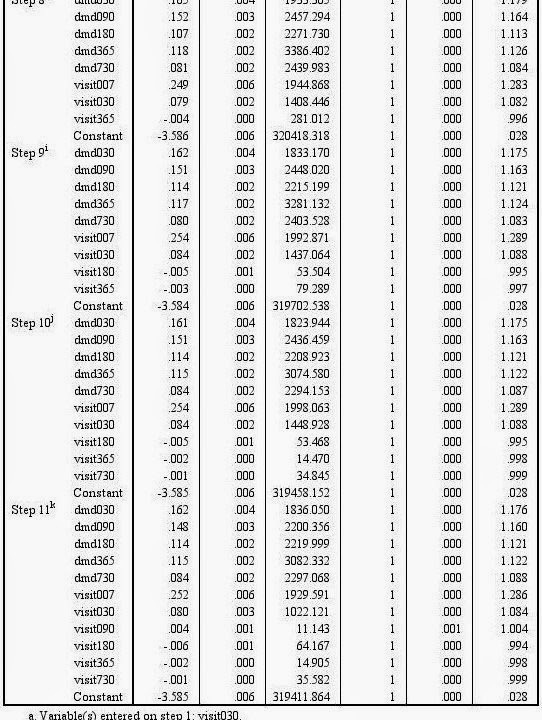 This is a stepwise regression equation (demand variables = demand / 100). Notice that in each step, demand variables are entered, and are entered significantly. In step six, the only visit variable enters the equation ... it's visits 0-7 days ago, and the coefficient is negative ... meaning that each website visit in the past 7 days cost this company $9.95 of average order value. Nice. In this case, I'd revert back to step 5, remove the negative impact of visit data, and conclude that visitation data does not impact spend if a customer repurchases next month. We now know the story of web visitation data. Each web visit in the past 7 days is worth about $170 of demand spent 30-90 days ago ... meaning that each web visit in the past 7 days is very important. This is a good thing! Each web visit 8-30 days ago is worth about $48 of demand spent 30-90 days ago ... meaning that each web visit 8-30 days ago has value. This is still a good thing, but the value of website visits are quickly degrading. Each web visit beyond 30 days contributes nothing toward future response. Nothing. These visits have no value, after controlling for recency and after controlling for historical demand. Remember the table at the top of the post? This table makes web visitation data look terribly important. The problem is that web visitation data is highly correlated with past purchases ... and this make sense ... you have to visit the website to purchase, so the two variables are measuring essentially the same thing. When you control for historical recency / demand, we see that web visitation data has an amazingly short half-life, with visits > 30 days ago having no bearing on future response. Of course, your mileage will vary. But in this analysis, on real data, the conclusions are self-evident. When I run this analysis, the vast majority of the time, I get an outcome similar to this outcome. That's why I mentioned the outcome in a prior blog post. It is always a possibility that you will learn something different. That's why, in the prior blog post, I asked the readers to run the models for themselves, to determine half-life for themselves. Do the work yourself - your mileage will vary! Again, catalog vendors, I just showed you how to do the work, for free. You may now apply the methodology to clients and prospects. How many of your competitors help you out like that? If I were one of the co-ops, I'd jump all over this - it would be a great way to assist catalogers who are struggling with co-op response rates - just merge web visitation data with purchase data, and you're set. If you have additional questions about the methodology, or wish for a deeper tutorial, please send me an email message (kevinh@minethatdata.com), and I will be happy to help you. Employees - An Important Part Of Your Omnichannel Strategy, Right? 47% of retail employees do not get paid sick time (click here). The omnichannel community convinces you, the business executive, to spend tens of thousands of dollars on consulting projects. Those projects lead to millions of dollars, sometimes tens of millions of dollars, on systems that enable your digital strategies to be realized. And then, once you've spent all that time and effort and money building your omnichannel vision ... you make sure that the last step of the process, your in-store employees, are well taken care of, right? RIGHT? Or do you pay folks $10 an hour, and if the employee is sick, well, God help 'em? I know ... if you're Macy's, you probably spend north of five billion dollars on employee salaries, annually (median employee salary is about $30,000), so that's not a trivial amount of money by any means. Might there be a way for employees to share in your omnichannel success? At $10/hour, you're telling them that they don't matter. It is common for a cataloger to have an ad-to-sales ratio of 30% or greater. It is common for an online marketer to have an ad-to-sales ratio of 15% or lower. Guess what the online marketer gets to do with the 15% marketing expense savings? To be competitive, the cataloger has no choice. The cataloger must stop mailing 20 catalogs a year to online-centric buyers. Next, the cataloger must greatly reduce co-op expense, which for catalogers with 40% or lower annual repurchase rates, is destroying the ad-to-sales ratio. It is nearly impossible for a cataloger to compete with an e-commerce business when 15% of sales are gobbled up on paper expense that does not materially contribute to the bottom line. Is it any wonder e-commerce businesses routinely out-compete catalogers? Send me an email message (kevinh@minethatdata.com) if you'd like me to fix this problem for you! This is one of the most common statements that is floated in my direction. I'm told, often, that folks try a smaller page count catalog, and it "generates less sales", so it didn't work. Well of course it's going to generate fewer sales - it has fewer pages. That's not the issue. There are things you do, and things you don't do, when creating a smaller page count catalog. Pack the catalog only with best sellers. This raises productivity. Circulate deeply ... for every 10% cut in pages, you can mail 10% deeper if you merchandise the catalog with winning items. Deeper circulation levels allow you to offset the demand you lose by cutting pages. Use existing creative proven to work. Offer fringe merchandise categories that have limited appeal. Back in the day at Eddie Bauer, this meant you didn't stuff the smaller format catalog with Home and Professional Apparel. Those categories, with limited appeal, drove down productivity, causing smaller catalogs to not work. Stop messing around with smaller format catalogs. Use new, untested, risky creative. Over-stuff the catalog with new, risky items. Reduce density in an effort to make a "brand statement". I have many clients that really dominate the smaller catalog page count format. They find they can generate 85% to 90% of the demand on half the pages. Do you understand what this does to the profit and loss statement? It turns the profit and loss statement upside down, that's what it does. 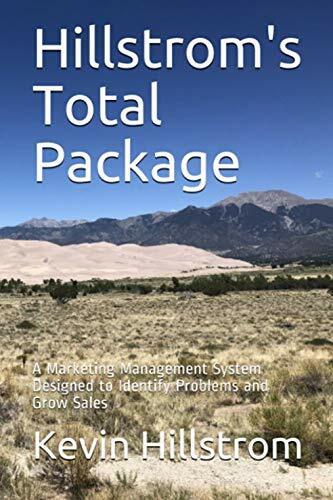 Say you have a 128 page catalog that generates $4,000,000 on 1,000,000 in circ - costing $0.75 each and, at a 35% profit factor, yields $650,000 profit. Nice. When you get the merchandising and creative strategy right, you generate 85% of the demand on half the pages. If the cost of 64 pages is $0.50 each instead of $0.75 each, then you run into a very interesting issue ... for all circ lower than 200,000 in depth, the smaller page count format is more profitable than the larger page count format. In other words, your numbers tell you that you can mail down to 1,000,000 circ on the 128 page count book ... but if you run the numbers up against each other, only 200,000 circ generates more profit at 128 pages ... and you can actually go all the way down to 1,800,000 at 64 pages. 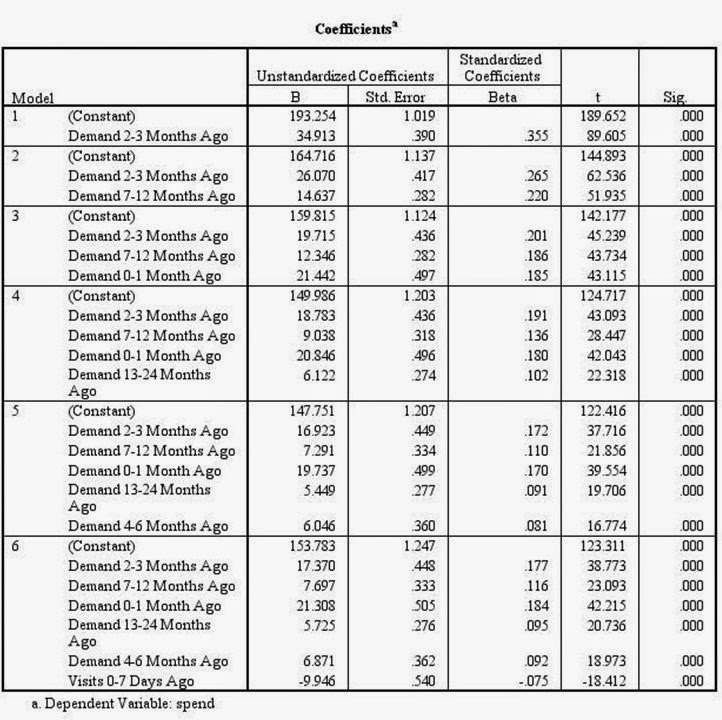 Base Case = 128 pages ... 1,000,000 circ ... $4,000,000 demand ... $650,000 profit. Optimal Case = 128 pages to 200,000 circ with 64 pages to 1,600,000 circ ... yielding $4,800,000 demand ... and $820,000 profit. Only 64 Page Catalog = 1,800,000 circ ... $4,562,000 demand ... $787,000 profit. Mixed circ (big + small) and small-only yield more profit than the current base case. Best of all, you now get to mail 1,800,000 customers instead of the 1,000,000 you currently mail. Wouldn't your co-op, printer, paper rep, and merge/purge house prefer this scenario? Let me repeat the last sentence ... wouldn't your co-op, printer, paper rep, and merge/purge house prefer this scenario? Wouldn't you prefer this scenario? In some cases, the strategy does not work - when the customer loves a broad merchandise assortment and has a low response rate, then the strategy can struggle - the low response rate is the key. Contact me (kevinh@minethatdata.com) if you would like for me to run scenarios for you. Many catalogers apply this strategy, and make a killing doing it. It's easy, and the health of your business improves. Why would you not at least try the strategy? Brian Williams has been suspended from broadcasting the news for six months (click here). Some of our younger readers would be amazed to learn that television networks summarize the daily news each evening, having a credible host present the information in an authentic manner, so that the news will be believed, so that people will watch, so that the networks can sell ad space and earn profit. Anyway, it appears Mr. Williams stretched the truth on a few of his stories. John Stewart will be stepping down from The Daily Show (click here). He often pointed out the inauthentic nature of others, if you equate often with daily. I learned about both, on Twitter, within moments of each other ... not via evening television. Times are changing. Times always change. In old-school media, Gen-X is in the process of throwing out the Baby Boomer generation. Online, Millenials are using mobile to throw Gen-X out of the future of the internet. What does any of this have to do with my/our industry? Can you believe what people tell you? Especially folks who are being disrupted by younger generations, by new media ... can you trust them when they tell you that omnichannel is the future, when they tell you that retail is stronger than ever even when comps and foot traffic tell you otherwise? Can you trust the printer who tells you that JCP is mailing one (1) catalog (proof that print works) but doesn't say a peep about SkyMall going out of business (proof that print no longer works)? Can you trust the online expert who tells you that a fusion of social and mobile will save your business, even if your average customer is 61 years old? Can you trust the VC who tells you that the future is the "sharing economy", if it means that peasants share while VC's get rich? Who do you trust? Why do you trust the individual? What does the individual do/say that enables you to trust the professional for honest advice? What is it about the person that radiates authenticity? And if that person makes an infrequent mistake, are you willing to forgive the person? This article is about Zulily ... $0 to $1,000,000,000 in five years. 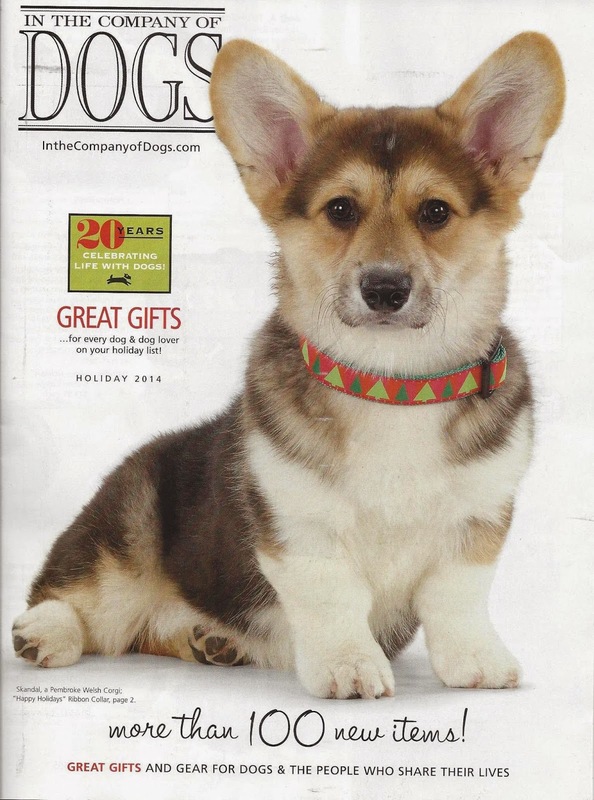 Every catalog industry professional must read this article ... click here. I know, I know, you're going to tell me that they're a flash sales business, and that they generate only 3% pre-tax profit, and their stock has been battered, and you have different problems and why can't I just solve your problems? Their Chief Merchandising Officer is somebody I worked with at Eddie Bauer almost twenty years ago ... a very bright professional with hard-core catalog knowledge ... much of the kind of knowledge you possess. In other words, she is smart, and you are smart, too. So maybe it's time to read this article from start to finish, and then think about the lessons learned at Zulily ... thinking carefully about what they've done that truly applies to your business. Something applies, I promise you that (just read the comments about Amazon). They publish a new website every day, for crying out loud, and they A/B test everything ... think about what they learn, think about the pace that they learn at ... then think about how fast you learn? That, alone, is worth pondering, don't you think? Here you go, my final set of slides for my session at the VT/NH Marketing Group session on February 19. Click here to download the slides. Why aren't you going to be there? Click here to register. We're looking at 180ish attendees. That's a lot of attendees. P.S. I am going to spend a considerable amount of time talking about "story". I've analyzed more than 150 companies since founding MineThatData - it is very, very clear what causes companies to be successful. 50% of success comes from merchandising brilliance. 30% of success comes from low-cost customer acquisition programs and an absolute corporate zeal to acquire new customers at a low cost. 20% of success comes from the story the brand tells. Tell me what the story is? "Share With Friends, Earn Credit". Their story communicates merchandise, low-customer customer acquisition, and a story "every day ... new" all at the same time. We're going to go through 45 images like this at the session. Many of the images are from the companies you work for. Think carefully about the percentages above. Merchandise ... do you sell stuff that Amazon or Big Box stores sell? Hmmm. Low Cost New Customer Acquisition ... do you have strategies in place, or do you pay Abacus a bunch of money and cross your fingers? Story ... what story are you communicating to your customers? I took each session offered at NEMOA next month, and depicted the buzzwords used to describe the session in two dimensions (a Principal Components Analysis, for those of you who want to give this a try). Each buzzword had to be listed in at least three of the twenty-three sessions I graded (click on the image to read the buzzwords). I added two words ... if a brand/client was presenting, I added the word "CLIENT" to the buzzword list ... if a vendor was presenting (as was the case in 17 of the 23 session I graded), I added the word "VENDOR" to the buzzword list. Now, this analysis is only relevant to one conference, and is only relevant to what the conference organizers chose to focus on, and is only relevant to the copy written in the conference literature. Omnichannel / Strategy / Sales is opposite of Best Practices / Merchandise. Content / Traffic / Acquisition / Engagement / Brand / Digital / Customers / Catalog is opposite of Analytics / Testing / Attribution. The opposites tell us how we think about concepts. It's hard to force testing upon somebody who cares about brand. It's hard to get folks to focus on merchandise when they are passionate about omnichannel. If you were running this conference, you'd probably want to measure "who" attends each session ... the analysis would tell you the type of individual (Executive, Director, Manager, Analyst, Client, Vendor, Marketing, Merchandising, Creative, Online, Circulation) who cares about various topics, allowing you to craft a more interesting conference in the future. Across the board, it's new customers. Namely, that's for so many companies, it is getting harder and harder to acquire new customers. In an omnichannel world with infinite channels, it has gotten much, much harder to find new customers. Ask anybody. The omnichannel playbook promises riches - the opposite is happening. In retail, omnichannel advertising strategies have dissuaded customers from leaving home, causing malls to empty. In catalogs, the co-ops are in the process of optimizing themselves out of business by sending the same 70 year old customers to most catalogers, greatly lowering response and limiting the overall universe. In e-commerce, new customer acquisition rates are slowing (ask eBay) as Amazon overwhelms the industry and as cannibalization from catalogs/retail slowly winds down. If your fiscal year begins on February 1, then the number one goal for your marketing team in 2015 must be to find clever strategies for finding new customers at low cost.